There are days when even the most organized person just doesn’t have much time to spend in the kitchen. So what is one to do when the clock is nearing the mealtime hour, the family is asking “When will dinner be ready” and we are ready to drop? How do we manage to provide quick and easy meals that will taste good while keeping everyone healthy? 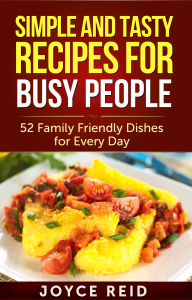 In this book, I am sharing with you some ideas for quick and healthy meals that I’ve learned through the years of raising a healthy family while growing several profitable businesses. All of them can be prepared quickly and easily. Most can be on the table within half an hour, a few may take a little longer, and I’m even including some really fast meal ideas that I probably wouldn’t resort to during the more leisurely times of year. I’ve been there and have kept this in mind while putting together this collection for you. The ingredients are not exotic or ones that you’ll buy to use once in a recipe and then wonder what to do with the rest. They are items that you can pronounce and can usually be found in most basic kitchens. In addition, I’ve included some tips and hints for speeding up meal preparation. This book ends the guilt while saving you time in the kitchen. Cooking doesn’t discriminate and neither does this book. It is for busy Mothers as well as Mr. Moms, college students with just a microwave and a tiny fridge, or singles cooking for themselves.